B&B in Betws-y-Coed in a peaceful riverside location in the Snowdonia National Park, North Wales. As the name suggests, this Victorian building was originally the police station and magistrate's court for Betws-y-Coed. It has been sympathetically restored and refurbished to provide comfortable bed and breakfast accommodation, and still contains many of its original features which make The Courthouse a unique B&B in Snowdonia. The Courthouse is the perfect place to stay in lovely Betws y coed and to explore Snowdonia and this beautiful part of North Wales. Mount Snowdon, Bodnant gardens, Portmerion, and the famous castles of Conwy, Caernarfon and Harlech as well as the many other attractions and adventure sports activities of North Wales are all within 30 minutes' drive, including the new Surf Snowdonia and Zip World. We are open all year including Christmas and New Year, and you can now purchase gift vouchers to treat someone special to a break in Betws-y-Coed at The Courthouse. Your hosts, Tanya &Richard welcome all our guests with refreshments when they check-in before 18.00. Please browse our website for more about what The Courthouse (Henllys) has to offer. We look forward to welcoming you to our B&B in Betws-y-Coed in the stunning Snowdonia National Park in North Wales. Lovely sunny cottage style room on first floor with King size bed + memory foam mattress. Views of hills and village. En suite with a large shower, wc and basin. Large bright room on first floor with superking double bed with memory foam matress. Views towards the village and hills. En-suite with bath/shower, wc and basin. Accessible ground floor room with small double bed and private lobby with sofabed. En-suite shower room. 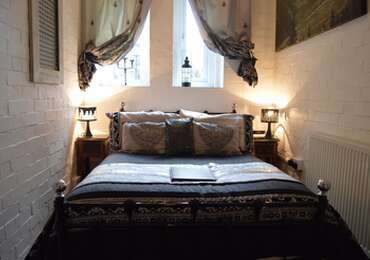 Formerly one of the old prison cells but is now a cosy double bedroom or family suite. A unique, atmospheric room with a bit of history.